Are Organic Eggs Free Range? This is largely a myth. The term organic only applies to the food the chickens are fed and the lack of chemical use in raising the chickens.Organic eggs can be produced from cage-raised chickens. Similarly free range eggs are seldom organic. It is hard to find a free range, organic egg and they are very expensive.There are lots of issues about 'organic' food and whether the extra cost is worth it. 2. When Eggs are Scrambled, do you Need to Add Water or Milk? If so Why? When eggs are scrambled, the proteins in the egg white are coagulated by the heat and stirring to form an interwoven gel. Adding liquid dilutes the proteins and the gel formed is softer. Added liquid creates steam which helps 'puff' up the mixture as it sets. Which is better water or milk? Both add liquid, but milk contains fat which softens the protein gel as the protein molecules cannot bind as tightly. Adding liquid as water or milk makes softer scrambled eggs, and full cream milk creates the softest scrambled egg. 3. Do Freshly Laid Eggs have Different Properties to Bought Eggs? Egg whites tend to become thinner with age. For this and other reasons related to 'Fresh is Better' many people believe that fresh eggs are much better for baking - bakes rise more, have a softer texture and a more even consistency and taste better. Apart from the extremes it appears that this is largely a myth. Freshly laid eggs are essentially the same as 'fresh' free-range eggs bought on the supermarket for cooking purposes. The richer, more yellow yolks or fresh laid eggs produced from your backyard chickens are always going to taste better for you and your friends. 4. Do Egg Grades Matter? 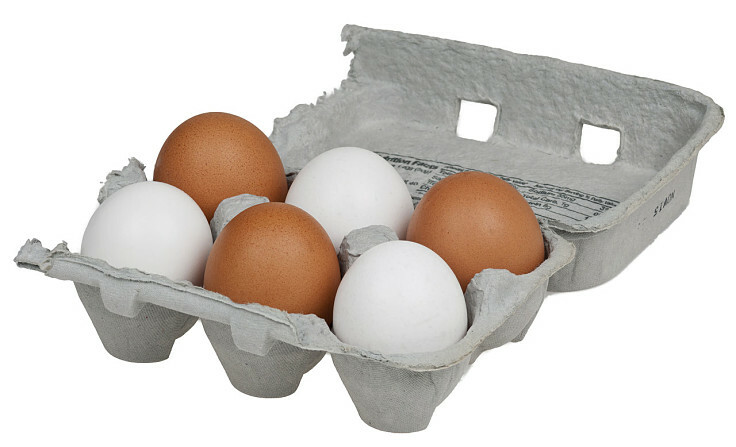 The USDA and other authorities throughout the world, grade eggs in various ways.The USDA labels eggs either 'AA', 'A', or 'B' according to shell appearance and internal quality of the egg, usually the density of the egg-white. Grade AA eggs have dense whites and the shells are smooth and not misshapen. The egg quality matters, not the shape of the shell or imperfection on its surface. 5. Are Pasteurized Eggs and Egg Products Worthwhile? Eating raw eggs is very risky. Raw egg can cause bacterial infections such as salmonella. Pasteurized eggs offer a safe solution, but whole pasteurized eggs and egg products are very expensive. The pasteurization process changes then baking characteristics of the eggs, and provided you only eat cooked eggs the extra cost is probably not justified. Chicken meat is one of the most common sources of bacterial contamination and food poisoning, yet it is sold with health warnings issued by various authorities. Cooked chicken products are safe. 6. Are Brighter Yolks a Sign of Fresh Eggs? The answer to this is "No". 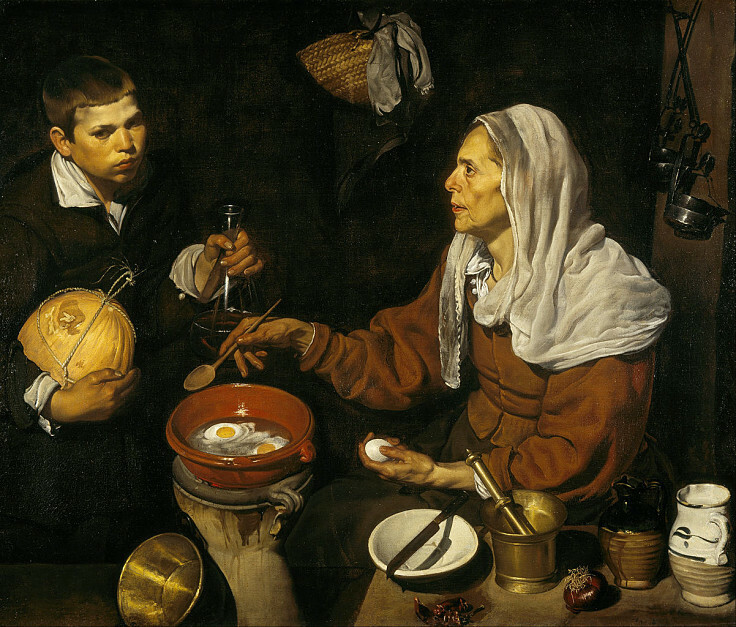 The color and brightness of eggs does not change as the egg ages. The yellow color of egg yolk is derived from plant pigments (xanthophylls) that the chicken consumes with its food. Corn and alfalfa feeds produce yellower yolks than feeds based on wheat and barley. 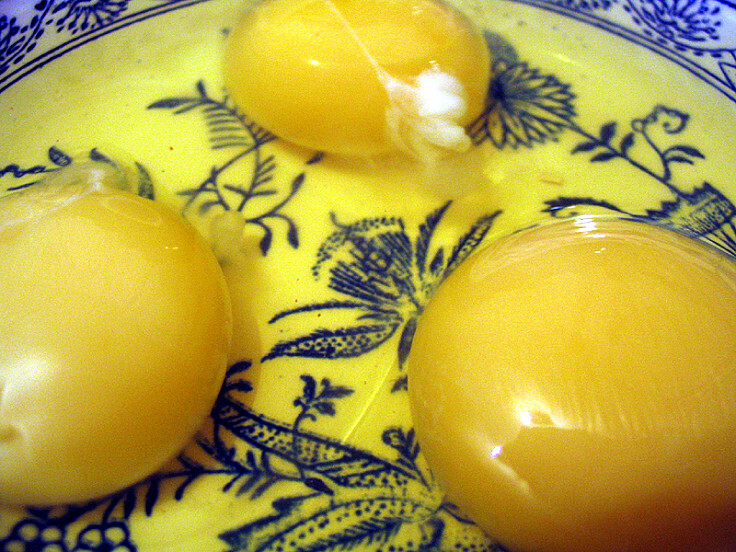 Free range and home raised chickensgenerally have yellower yolks. Some egg producers use marigold petals and other pigments (natural and artificial) to deepen the color of the yolks. 7. Why is Adding Eggs One at a Time Better than adding all the Eggs at Once? Cakes and cookies prepared by adding eggs one at a time tend to be firmer and the mixture is less 'watery'. Adding eggs more slowly produced lighter baked products. Adding all the eggs at once produces cakes and cookies that are denser and more rubbery. It is almost as if the mixture gets overwhelmed with the eggs. There is no time to incorporate them properly. Eggs and butter are hard to incorporate. It is a matter of trying to mix water (eggs) and fat (butter). It takes time and effort and works better if done gradually. 8. Do Eggs Increase Blood Cholesterol and Risks of Heart Disease? Chicken eggs, mostly the yolks, are high in cholesterol, but egg consumption has less affect on blood cholesterol than eating foods rich in saturated fats and trans fats. Eggs also contain many nutrients that potentially reduce the risks of heart disease, such as vitamin D, vitamin B12 , riboflavin, and folate. Most healthy people can eat 5-7 eggs each week without increasing their blood cholesterol levels or risk of heart disease. Egg whites contain virtually no cholesterol. 9. Should Eggs be Stored in the Refrigerator and Brought to Room Temperature Before Baking with Them? Salmonella bacteria multiply quickly at room temperature and eggs get stale quicker outside the refrigerator. So choose eggs that are keep cool in the shops where you buy them. Transfer the carton of eggs to the refrigerator when you get home. The USDA recommends that you don't keep your eggs in the devices fitted to the doors of many refrigerators, despite being designed for this purpose. Store your carton of eggs in the coolest part of the refrigerator. When baking it is wise to bring the eggs to room temperature before use. The same applies for butter and milk. The cold temperature retards the mixing process. 10. 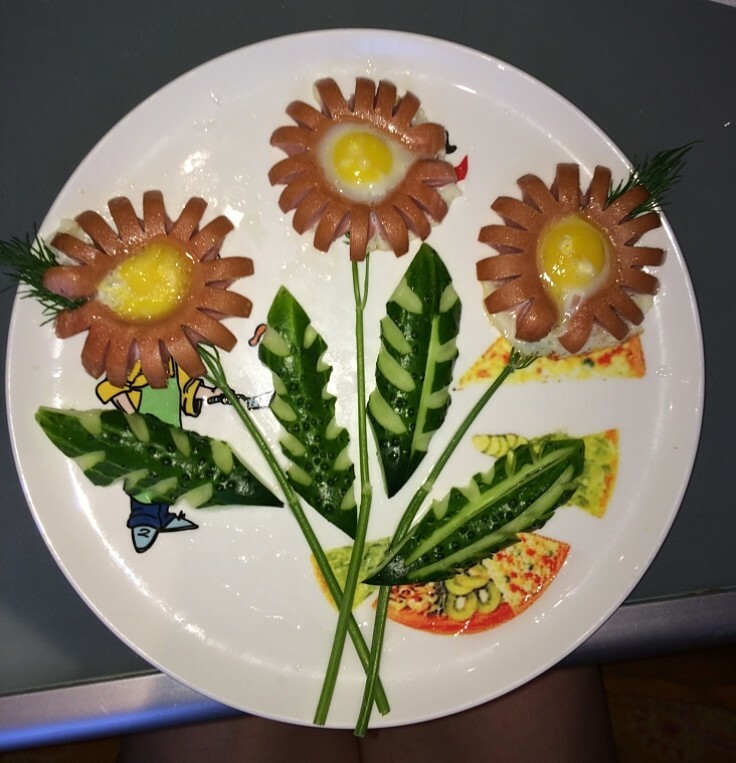 Fresh Eggs Sink in Water, Stale Eggs Float. True or False? Fresh eggs will sink to the bottom of a pot of cold water; stale eggs will float. Eggs gain air from the atmosphere gradually after they are laid and more carbon dioxide is released inside as the living content within the egg metabolises. But there are exceptions, especially with eggs from hens in the backyard. Some of their eggs float. Bad eggs sometimes sink as well. So use other methods to test freshness. Eggs are a universal ingredient for a wide range of dishes. Eggs are indispensable. Most people eat eggs in one form or other, during most meals as eggs are an ingredient in baked goods, sauces and even pasta. But, there are many myths about eggs that need to be resolved to give you more confidence about eating eggs. Whole eggs can be prepared in some many different ways - baked, boiled soft or hard-cooked, poached, scrambled and fried, made into omelettes and used in smoothies, egg flips and many health drinks. Eggs are an essential ingredient for most baked goods - bought and home made. But, how much do you really know about eggs and how to use them properly and smartly for various purposes. Below are the top 10 useful facts about eggs.